Open the door to a beautiful NEW experience for your home. Fine Fragrance Mist infused with essential oils. Light, layered scents in a continuous fine mist, captured in a crystal clear bottle. 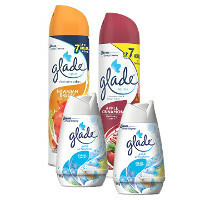 Glade products are the only fresheners I use. Thank You for the coupons.